I had made this cake on an odd day when I was actually feeling like baking a cake-cake complete with frosting and all. That time, I had quite a few oranges in my fridge and had recently bought some really good hershey’s dark cocoa and ghirardelli chocolate. This match of chocolate and orange was made in heaven! D-I-V-I-N-E! I looked up recipes for chocolate frosting- the two best options available to me were making a chocolate butter cream frosting or a chocolate gananche. Now because making the ganache required cooking the chocolate, the lazy person in me was not thrilled with it. The butter cream frosting would have meant me adding atleast a 100 g of butter to just the frosting- the nutritionist in me groaned! So then, I decided to use low fat cream for the two frosting used in this cake- the one filled in the middle is orange cream and the one slathered on top is chocolate orange. And of course, the cake also has orange zest and orange juice. I could have added cocoa powder to the cake batter, but in retrospect, I quite like the contrast of the dark chocolate with the orangey yellowy cake and the filling in the middle peeping through! – Preheat the oven to 180 degrees. -Sieve the all purpose flour and baking powder and keep aside. Cream the butter, sugar and eggs till fluffy. -Now alternately add the flour mix, orange juice and milk to the creamed butter and mix well. – Bake the cake in a prepared 9 inch round tin at 180 degrees for 45 min. If you have two such tins and a large oven then, divide the batter into half and bake two cakes out of this. I don’t have two tins so I just baked one cake and then cut a cross section of the ready cake using a sewing thread. Just keep in mind that the cake might need less baking time if you are baking it in two tins. – Once the cake is ready, keep it on a wire rack to cool. Remember, never to get hasty and begin frosting a warm cake! – Whip up the cream to give soft peaks while continuously adding icing sugar to it. Once the desired easy spread consistency is achieved, add the orange zest and flavoring and fold it in well. Keep this frosting in the fridge for about 5-10 minutes so that it is not too soft when you spread it on the cake. – Mix the cocoa and sugar in a bowl. Whip the cream to a fluffy consistency, then slowly start adding the cocoa sugar and orange flavor and mix well till a nice spread consistency is achieved. If the frosting seems too thick, add one to two tbsp of milk. – Put this in the fridge for 5 min so that it does not become runny consistency when spread on the cake. -If you are using two cakes then remember to assemble the top cake upside down on the bottom cake so that you get an even surface for the final frosting. -If you are like me and have cut the cake into a cross section, then keep the top portion aside. Now frost the middle of the cake with the orange cream frosting so that it becomes a filling at the centre. Leave about 1 cm space free from the edges as the frosting will ooze out when you keep the top cake back on it. -Reassemble the top of the cake and give it a quick press so that the cakes stick to each other. Now spread the chocolate frosting on the top and the sides of the cake as neatly as possible (!). If you want to go the old fashioned way then you can even create wavy peaks on the cake frosting. -As a final touch, grate good good dark chocolate (I have used ghirardelli) on the top of the chocolate frosting. If you are more creative, you can even make chocolate swirls, decorate the cake with sugar flowers or pipe some icing! This entry was posted in Healthy Recipes and tagged chocolate cake, chocolate frosting, chocolate orange cake, low cal chocolate cake, orange cake, orange zest. Bookmark the permalink. One of my favorite combinations! 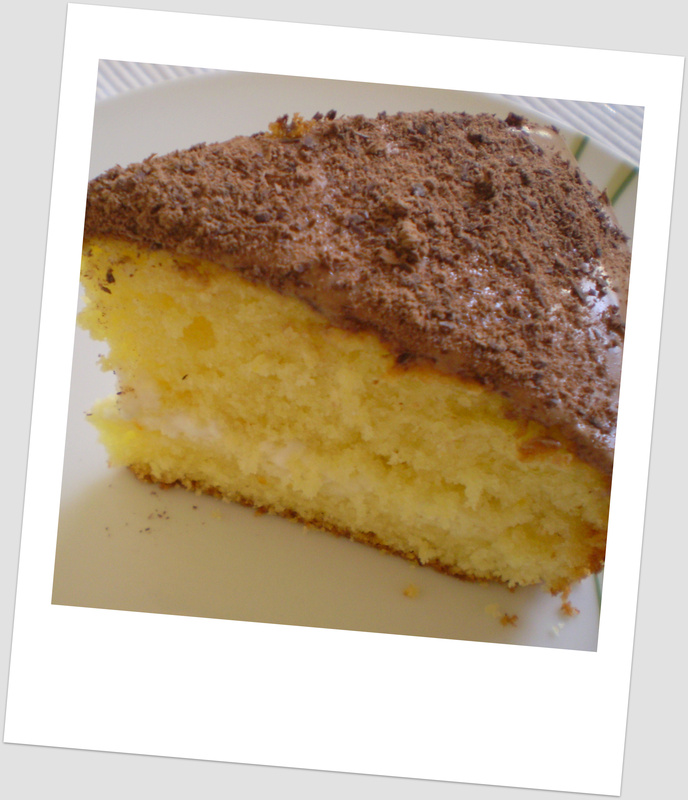 I make an orange and Nutella cake much in the same way, and it allows me to enjoy chocolate without too much guilt. This one looks really nice and delicate! The cake looked so awesome that I couldn’t resist myself from reminding you. In fact, I should “Thank you” for quickly responding to my comments and updating on your blog. I will surely make it..It looks so delicious. I will try to get the pic of it and upload it 😀 . And “YES”, I will keep on troubling you for the healthy recipes that you always post on this blog. Amazing recipe..but a quick question….how do i make orange zest? for the zest- grate the orange on a fine grater. make sure that you dont grate till the white pith, that will make your cake bitter. grate the orange skin on a coarse grater. you also get fancy zesters by OXO. Can i use store bought juices for this recipe? Yes you can garima. But just use fresh orange zest.